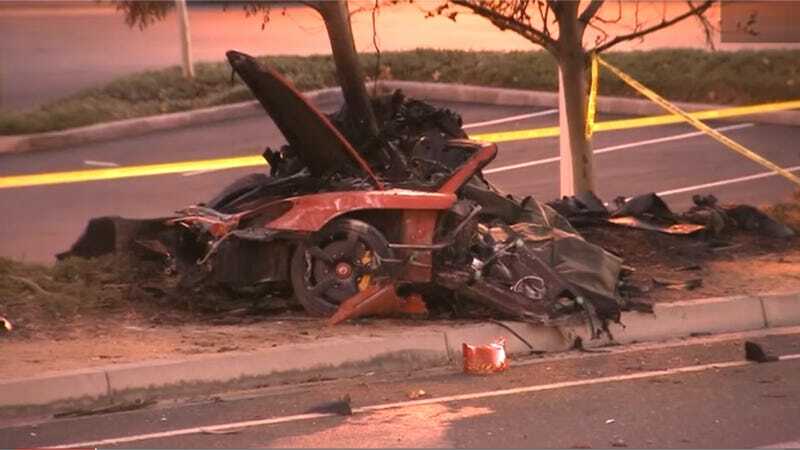 Earlier today a Los Angeles County Sheriff's Department official said investigators were examining whether the Carrera GT that crashed and killed actor Paul Walker and his driver was engaged in a street race. Now authorities say they have ruled out the presence of a second vehicle in the crash. CNN this evening reports that "investigators have been unable to find evidence of a second car" in the Saturday crash that killed Walker and race car driver Roger Rodas, who was behind the wheel. Authorities can now rule out racing as a cause of the fatal accident. Earlier today video showed a yellow Honda S2000 at the scene of the wreck. But a post on the S2Ki forum indicated that it belonged to a bystander who showed up to help put out the flames. Instead, police are focused on speed as a factor in the crash. NBC News reports that the Carrera GT was traveling 40 to 45 mph when it came to a bend in the road where the speed limit drops to about 15 mph. That's where Rodas apparently lost control of the car, sources told the news network. The street is covered in skid marks, fueling speculation in some media reports that Rodas, a professional racer, was engaged in a speed contest at the time of the crash. But Jim Torp told reporters near the crash site Monday that the rumor wasn't true. The Porsche, along with another car, had already been sold, so the men were not going out to be reckless, he said. He recalled how the tragedy unfolded, starting from the moment when Walker and Rodas slowly pulled out of the driveway as a charity event was winding down. A California Highway Patrol officer was parked just down the street, he added. "You could hear the exhaust — they got on it a little bit — and I heard two booms," Torp said.